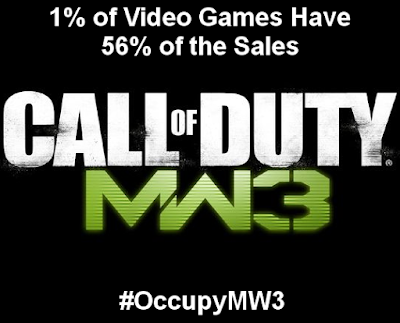 Call of Duty: Modern Warfare 3 launches tonight at midnight and it is expected to break sales records. One analyst is predicting over $1 billion in sales in the first six weeks. Occupy Wall Street is protesting that 1% of people are too wealthy and have too much power compared to the 99%. Studies show the wealthiest 1% of Americans own 42% of the wealth in the USA. Wealthy American's have nothing on video games! The top 1% of video games represent 56% of the total sales! People should be protesting the injustices of sales inequality in video games. Won't somebody think of the other 99% of games. Methodology: The 56% is based the dollar value of games sold on eBay during the last 30 days. That's pretty crazy. And to think, a good portion of those games are part of a seemingly never ending series that essentially rereleases the same game every year with slight variations. Here's looking at you Madden and Call of Duty. Oh how I long for the good old days when games were games and not regurgitated garbage year after year. Nice!, considering that games are made changes or let me say ,`progress` , appropriately to feed the gamers with a more satisfactory impression, to enable them to resort through these games the gratitude they felt towards the support of gamers to their invented games. These Call of Duty must be very good enough to have been able to reach 3 releases,congrats..